TRUST YOUR GUT! We pack our probiotics with farm fresh food so you can always trust your gut, and a trustworthy gut is a happy gut! That's why we deliver our nourishing probiotics with prebiotic foods like beet, burdock, and dandelion root; and add farm fresh ginger, turmeric or cranberry from our friends at Kauai Organic Farms and James Lake Farms. 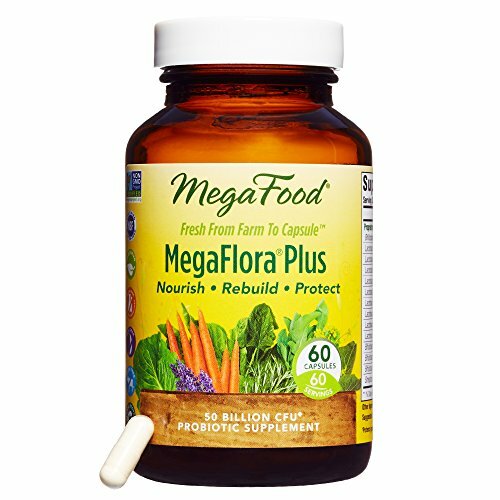 A Special Note on Packaging: MegaFood has done extensive testing on their probiotics for shipping purposes. They've shipped to places like southern Florida and Texas in the hot summer months, and found that they are good outside of refrigeration for up to 7 days in these hot temperatures for shipping purposes. In the cooler months or room temperature, it is more like 14 days. Because of this research, MegaFood has decided to lessen their impact on the planet with waste and not include ice packs in their shipments. SUPPORT GOOD DIGESTION: Supports intestinal health, bowel regularity and immunity. Restores and maintains balance of healthy probiotics. 50 billion active bacteria, of 14 life enhancing strains. NOURISH AND PROTECT: Gently filtered from food growth media and tested to be free of gluten, dairy and soy and helps to restore and maintain balance of healthy probiotics.